Samsung Galaxy Note 8.0 review | What Hi-Fi? The 8in Samsung Galaxy Note 8.0 gives stylus connoisseurs a tablet that sits somewhere between pocket-sized and full-sized. It’s gone for the sweet-spot that Apple too has decided is the perfect size for a small tablet. And at £300, the Galaxy Note 8.0 is squaring up directly to Apple’s iPad Mini with Retina Display, too. We can’t help but think it’s picked the wrong battle. To be fair to the Note 8.0, it was launched towards the beginning of 2013, when the original iPad Mini was still hot property. It pipped it for screen quality then, with its 1280 x 800-pixel resolution and dense 189 pixels-per-inch count, and it was quicker too, with a 1.6GHz quad-core processor. But, of course, things are different now – and that isn’t good news for the Note. Most online shops are holding the £300 price, with a few dipping just below, but not enough that can make the Note 8.0 a viable proposition in today’s market. Even the £120 Tesco Hudl can claim a better-quality screen and a similar quad-core processor. The Note is encased in a glossy plastic chassis that feels similar to the Samsung Galaxy S4. Like the iPad, it has kept a physical home button on the bottom bezel, with two touch-sensitive buttons either side to go back and bring up a sub menu. It’s light enough to hold and its curved edges means it sits comfortably in the hand. Like the S4, it’s not the most premium-feeling device, but it feels solid enough all the same. Slotted into the bottom right-hand corner is the Note’s S-Pen stylus, which is bound to be one of the big selling points of this tablet, and could well be the feature people are willing to pay a premium for. When you remove the S-Pen, a menu is automatically launched with all S-Pen optimised apps. You can use the the stylus just like you’d use your finger, but it allows for more precise selection and opens up the option for you to take and save handwritten notes, for example. It works well, with taps never missed and pen-stroke always captured – it can even sense the S Pen an inch or so above the screen, with features like Air View allowing you to hover over an email or text message to show you a preview of it. There are a number of these Samsung-specific apps and features built into the TouchWiz user interface that sits over the now rather dated Android 4.1.2 operating system. From our experience, they will go largely unused – although the S-Pen apps are perhaps the exception here. The interface is bright and colourful, but feels overly clunky and cluttered compared with the vanilla Android experience on the Google Nexus 7. It’s responsive enough, though, and runs smoothly, offering a relatively stutter-free experience. 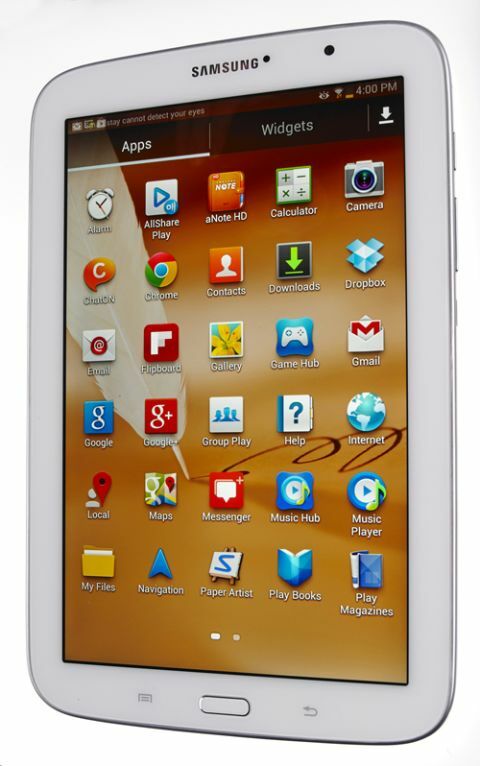 Rivals, such as the Nexus, have Full HD screens – and next to these, the Samsung Galaxy Note’s lower-resolution display is shown up. Text looks less sharp around the edges and video lacks the clarity now on offer elsewhere. There’s overall a lack of subtlety here that means finer detail is lost too, with edges over-etched – which makes them seem fuzzy. Colours are reproduced well, although the brightness of the whites feels like a result of the downright brightness of the screen. Whack this up to full and you certainly won’t have a problem using this tablet in sunlight – though you will see it take a toll on the battery life. We found the 4600mAh battery lasts just over seven hours with fairly heavy use at mid-to-high brightness. Expect less at full chat. On the subject of specification, the Note is available in 16 or 32G storage options, there's also a microSD cardslot for expanding by up to 64GB. The music performance from the Note 8.0 is simply OK – it lacks the organisation and solid cohesion of some of the better tablets, and could do with a bit more punch and precision if it wants to come close to taking on the iPad Mini. But tonally it’s balanced. It’s precise with rhythms and proves an altogether inoffensive listen for music and movies. The Samsung Galaxy Note 8.0 showed promise when it was released, but its weaknesses are easily exposed by newer rivals – even more so when you consider its price is among the highest of tablets this size. It serves as a stark reminder of just how fast technology is moving when a tablet less than a year old looks as outdated as the Note 8.0.